Preheat the oven to 350ºF. VERY LIGHTLY spray the edges of a 10" cast iron skillet with cooking spray. In your prepared cast iron skillet, heat the butter over medium heat until butter has melted and is foaming. Whisk in the brown sugar and cook, whisking constantly for about 2-3 minutes until the brown sugar has melted, the mixture has bubbled, and has thickened to a nice bubbling caramel. Add the vanilla extract, but be careful because the caramel will start to sizzle and possibly spatter. Whisk until the vanilla extract is fully incorporated. Remove from heat and set aside for about a minute to cool slightly. 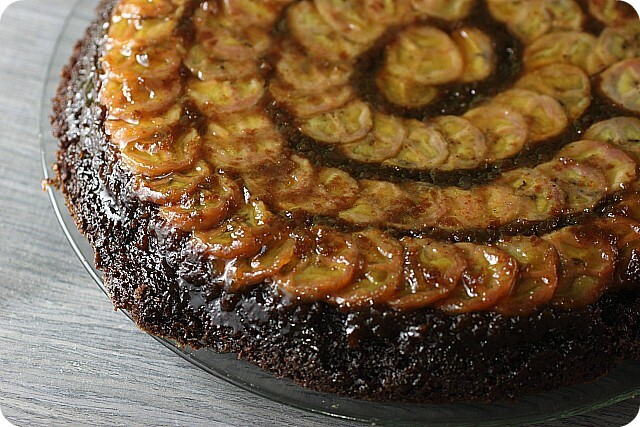 Arrange the banana slices in concentric circles on top of the caramel mixture and set aside. To a medium bowl, add the flour, cocoa powder, baking soda, and salt. Mix to combine and set aside. In the bowl of an electric mixer, combine the butter and granulated sugar and beat on medium-high speed until fluffy, less than 2 minutes. Reduce the mixer speed to low and add the eggs, one at a time, scraping down the sides after each addition. Turn the mixer to high speed and beat until the mixture is light and increased in volume, about 1 minute. Stir in the vanilla. At this point your mixture might looks to look sort of curdled. Its ok – We’re going to fix that. Reduce the mixer speed to low and stir in 1⁄2 of the flour mixture, followed by ½ of the milk. Repeat with the remaining flour and milk. Mix until just combined. You should still see some dried flour bits. Scrape down the sides of the bowl and beat the batter on high speed for NO LONGER THAN 8 SECONDS. I mean it! Pour the batter over the bananas and gently spread it into an even layer using an offset spatula. Place in the oven and bake until a toothpick inserted into the center comes out clean, 40 to 45 minutes. Transfer the skillet to a wire rack and let stand for about 5 minutes. Place a plate over the skillet and holding the skillet and a plate together with oven mitts, immediately invert the hot cake onto the plate. Let the cake cool for 20 minutes and serve warm or at room temperature. This cake will last about 2 days, but its best eaten the day its made, as the bananas start to look funky after a day. 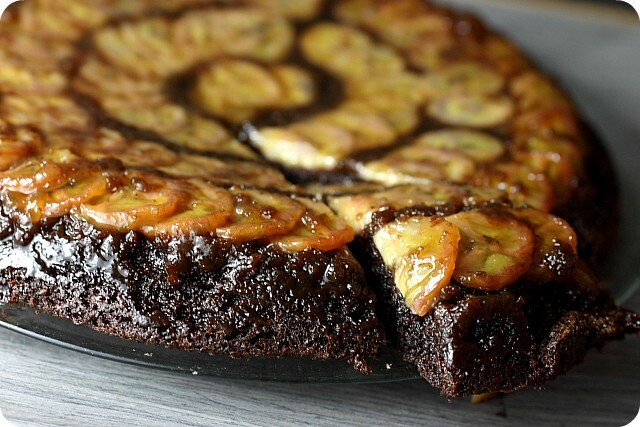 0 Response to "Chocolate Caramel Banana Upside down Skillet Cake"